SD cards and microSD cards of all varieties permeate the consumer market. The price is continually dropping. They’re mass produced in huge factories in Asia. The cost of materials is so low you may start to wonder is there a way to ensure you receive a high quality SD card for your automotive, medical, body worn camera or other demanding product? Do you really want consumer SD or microSD cards for these projects? Not if storage is a critical component of your solution. You’re dealing with narrow requirements, and you don’t have room for mistakes and equipment malfunctions. Home users of electronic equipment like SD cards can work around the occasional dud or random defective piece, but working in a professional industry is a different ballgame. What to a causal user is simply an annoyance can make the difference between success or failure, and the odds aren’t small. You need to get things right the first time. That’s why industrial SD and microSD cards aren’t an option for those working in certain industries—they’re a necessity. All SD cards are not created equal, and comparing your industrial SD card with one bought off the Walmart shelves is like comparing a grocery store hot dog with fine Paris cuisine. The cards you buy off store shelves are produced with minimal quality control, and there’s no consistency even among cards that come from the same manufacturer. You might test a hundred and find one you really like, but there’s no guarantee that the next one you buy with the same labeling is made of the same components or has anything like the same capability. There’s no guarantee for what’ll happen when you put it under stress. 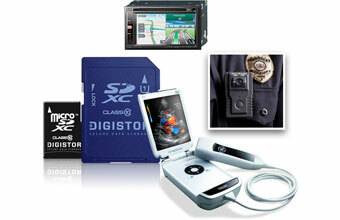 What about DIGISTOR industrial SD cards? These come with a price tag, but there’s nothing arbitrary about the price: you get what you pay for. In this case, it’s high quality MLC/SLC NAND, a wide temperature range, and Consistency spelled with a capital C. It means you don’t have to worry about the bill of materials (BOM) changing on you—and that’s huge. If you build an application around one of our SD or microSD cards you can have the confidence to know that these cards will continue working in future instances of the application: no unpleasant surprises, no need for frequent retests. Using an industrial SD or microSD card means you get quality and you get control. You get to utilize the resources within the controller. You have control over the BOM. Nothing can change without your say-so, and you know exactly what the capabilities of your cards are in every instance. We’d be happy to share more with you about our industrial quality SD cards—just call us for more info. DIGISTOR stands for reliability and quality, and SD cards for your industrial application is one case where those two things really do matter. This entry was posted in Memory Cards, Secure Storage by DIGISTOR. Bookmark the permalink.